For more than 50 Years, Springfield Paper Specialties has served Montgomery County, Bucks County, Philadelphia and the Tri-state area. We offer a full catalog of maintenance, janitorial, and shipping supplies for businesses as well as individuals. Our catalog includes products such as corrugated cartons, boxes, adhesives, packing and shipping materials, and a full inventory of janitorial supplies. Springfield Paper Specialties is a local, family-run production, moving, manufacturing, and shipping supply business. Using our own trucks and distribution center, we actively stock everything a business or individual needs to package and ship goods from one place to another. However, shipping supplies aren’t all we specialize in–we also carry a full catalog of office and business products as well as custom printing options, making Springfield Paper Specialties a one-stop shop for all your business needs. We understand the importance of providing unparalleled service while building close relationships with our customers–a reputation we’ve proudly maintained since 1963. Along with competitive pricing and a hand-selected product catalog, Springfield Paper Specialties relies on a network of top-tier suppliers as well as a team of industry experts to create value for over 2,000 local businesses. 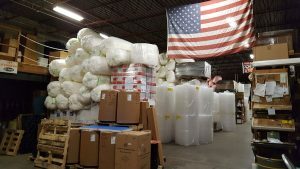 We are a one-stop shop for wholesale shipping supplies, packaging supplies, bathroom products, janitorial needs, adhesives, and break-room goods. Our goal is to simplify your weekly operations so you have more time to concentrate on driving your company or project forward. Our reputation for solid, dependable service begins with our vast on-site inventory, quality products, and prompt delivery. The backbone of Springfield Paper Specialties is our loyal, dedicated team. With many employees logging over 25 years with the company, our experience is unique in the industry. In fact, the current owner is the very first person hired by the original owner! It is the skill and experience that form the foundation–and continued legacy–of the Springfield Paper company’s brand of service. And in the end, it’s our long-term customer relationships that prove we’re doing it right. We also make all deliveries with our own fleet of trucks driven by Springfield Paper Specialties employees. Whenever possible, customer orders are processed immediately and delivered next day, adding speed and efficiency to a single-source supplier. Springfield Paper Specialties also manufactures a full catalog of custom packaging and shipping supplies, including printed cartons, size-specific cartons, foam inserts and partitions. Give us a call and our sales team will be happy to help you find the best solution to fit both your packaging needs and budget requirements. © 2019 Springfield Paper Specialties. All Rights Reserved.